If you want to feel cool, relaxed and feminine, then go for one of these Coachella inspired outfits for your next Summer. The first outfit idea is a gold sequin dress with white combat boots. The other cool look is the one consisting of a mustard orange dress with lace-up back completed with a fedora hat and white ankle boots. The third style features a wash blue denim jumpsuit and black leather combat boots. Check out this amazing knitted dress with long sleeves and wrap skirt. A perfect design for Spring street walks. Complete this seventies style with layered necklaces and white leather clutch bag with a chain strap. Complete this look by adding a black leather belt. What do you love about this look? A perfect Summer look for young ladies. We see a pastel blue T-shirt tucked in white cargo pants completed with a pair of black leather combat boots. Another Summer style for making a wow statement. We see a bandana print crop top in maroon styled with blue denim overall dress and combat boots in white. Sparkle outfit. Check out this simple day look for Summer. We see a sparkling denim jumpsuit completed with white sneakers. I definitely recommend giving it a try. An ideal combo for young ladies. Wanna play cool, sporty and free-spirited? Go for this white peasant dress with a black belt. It will be a perfect clothing staple for hot summer days. Complete it with chunky white sneakers. In love with simplicity? 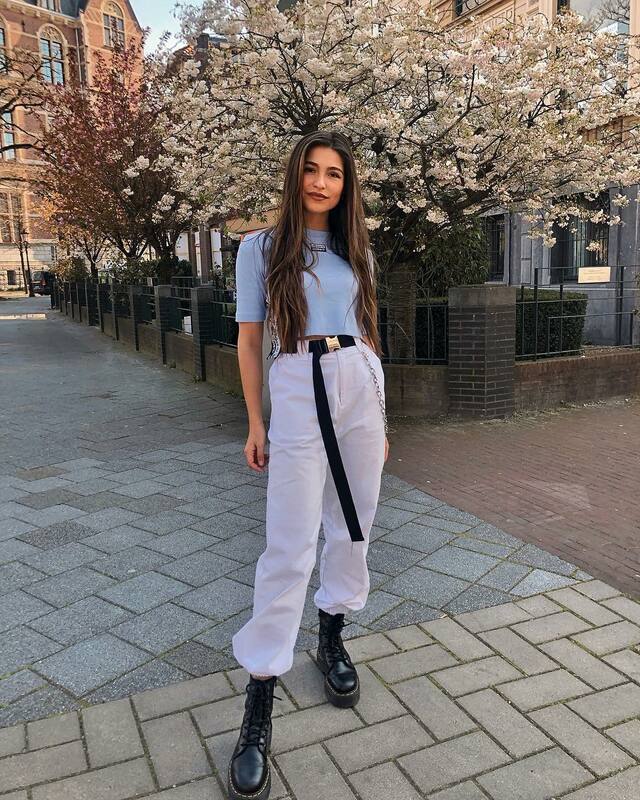 Make some fun with this amazing cargo jumpsuit in white. Style it with awesome white leather cowboy boots. An ideal style for casual weekends and parties. OOTD @maffashion_official – what do you love about this look? In love with urban style and military details? Go for a white crop tank top and team it with khaki olive cargo pants and platform black leather loafers. Complete this combo by adding a black leather jacket.